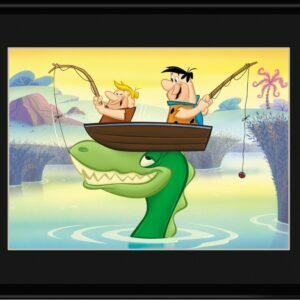 Fred and Barney Fishing Lithograph is a Limited Edition of 5000 pieces. Comes matted and framed with Certificate of Authenticity. 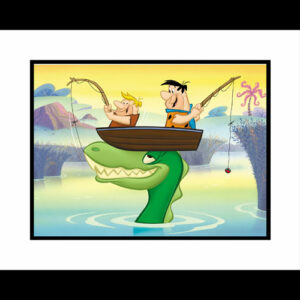 Size 11×14..
Fred and Barney Fishing is a Fine Art Giclee Limited Edition of 500 pieces. Comes matted and framed with Certificate of Authenticity. Size 16×20. 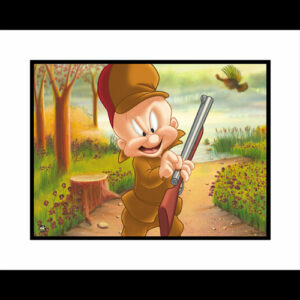 Turkey Hunting Elmer Lithograph-perfect for any hunter with a sense of humor. Matted and Framed Size 11×14. Limited Edition of 5,000 pieces, includes Certificate of Authenticity. The best known Elmer Fudd cartoons include Chuck Jones’ masterpiece What’s Opera, Doc? 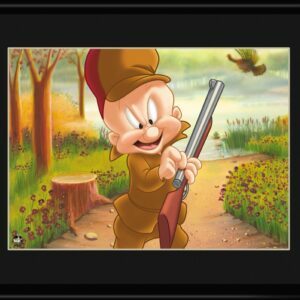 (one of the few times Fudd bested Bugs, though he felt bad about it), the Rossini parody Rabbit of Seville, and the “Hunting Trilogy” of “Rabbit Season/Duck Season” shorts (Rabbit Fire, Rabbit Seasoning, and Duck, Rabbit, Duck!) with Fudd himself, Bugs Bunny, and Daffy Duck. Fine Art -Turkey Hunting Elmer Giclee- perfect for any hunter with a sense of humor. Matted and Framed Size 16×20. Limited Edition of 500 pieces, includes Certificate of Authenticity.